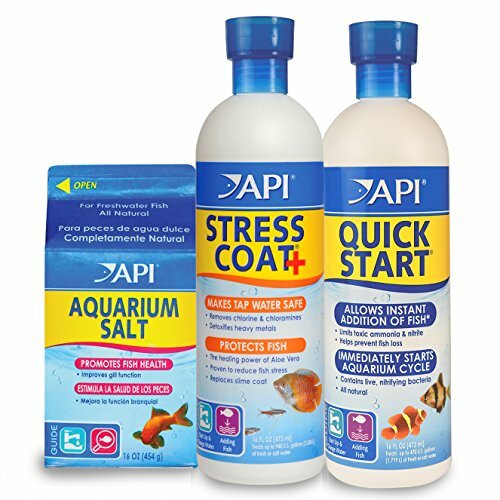 Get your tropical aquarium off to the best start with API QUICK START, STRESS COAT, and API AQUARIUM SALT. The unique, patented nitrifying bacteria in API QUICK START are scientifically proven to quickly consume ammonia and nitrite to help prevent fish loss in a new aquarium or when adding fish by allowing immediate addition of fish to your tank. API STRESS COAT treats your tap water, and provides a safe environment for freshwater fish instantly and easily. Tap water contains chlorine, chloramines and ammonia which can cause gill and tissue damage, breathing difficulty, stress and possibly fish loss. API STRESS COAT works instantly as a water conditioner to remove chlorine and chloramines from tap water and neutralize heavy metals. A lack of electrolytes in freshwater aquariums may cause serious health problems for fish. API AQUARIUM SALT supplies electrolytes to improve fish respiration. Made from evaporated sea water, API AQUARIUM SALT is a natural fish tonic with natural active ingredients. API AQUARIUM SALT promotes the overall health of your fish by improving their gill function and reducing stress in a freshwater aquarium. This all-natural salt provides the essential electrolytes fish need for the uptake of oxygen and release of carbon dioxide and ammonia through the gills. API water conditioners work to provide a safe, hospitable environment for fish such as tropical community fish, cichlids, goldfish and more. With API Aquarium products, it’s easy to keep a beautiful saltwater, freshwater or reef aquarium. At API we understand the rewards and relaxation of fishkeeping because we have a passion for fish too! For over 50 years API has developed premium solutions with proven and effective results for your family and ours. API offers a range of testing kits, water conditioners, and nutritionally superior food, because we’re dedicated to making a better underwater world.